For one night only, Cargo in London will be holding an illustration exhibition comprising of an eclectic mix of work from 60 illustrators and designers, on Wednesday 22nd August 2012 / 6pm 'til late. 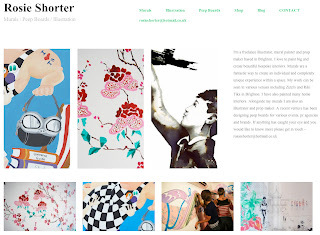 Curated by illustrators Lucy Joy and Rosie Shorter the exhibition began as a portrait-swap. 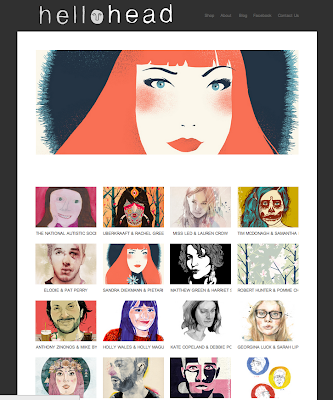 Each illustrator's name was picked from a hat and paired with another at random. Tasked with drawing the other in their own unique style the results are beautiful, weird and wonderful! 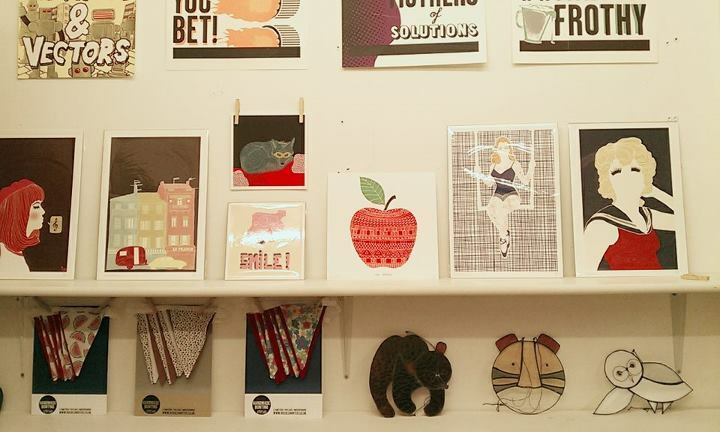 There is some fantastic work on show from the talents that are Jack Teagle, Holly Wales, Bob London, Gemma Correll, Pat Perry, Telegramme Studio, Pomme Chan, Kate Copeland, Pietari Posti, Miss Led, Tim McDonagh, Sandra Diekmann and many more. The night is bursting at the seams with fun and creativity for all. 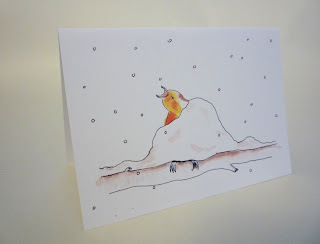 There will be a silent art auction of all the prints (so bid your max and cross your fingers!) 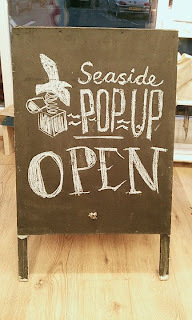 Live portrait drawing, a pop up shop, plus an interactive set and lots more. 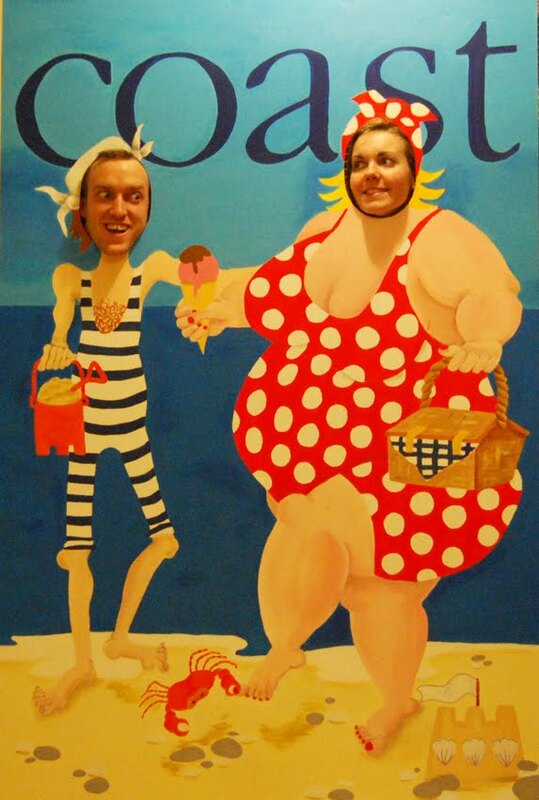 Be sure to bring your pennies as all money raised goes towards the National Autistic Society. This year the NAS celebrates its 50th Birthday with the theme of 'friendship'. Embracing this we did a call-out for artists young and old from the NAS to be involved in the portrait swap project. 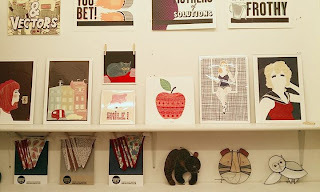 There was a great response and all will be on display at hellohead. 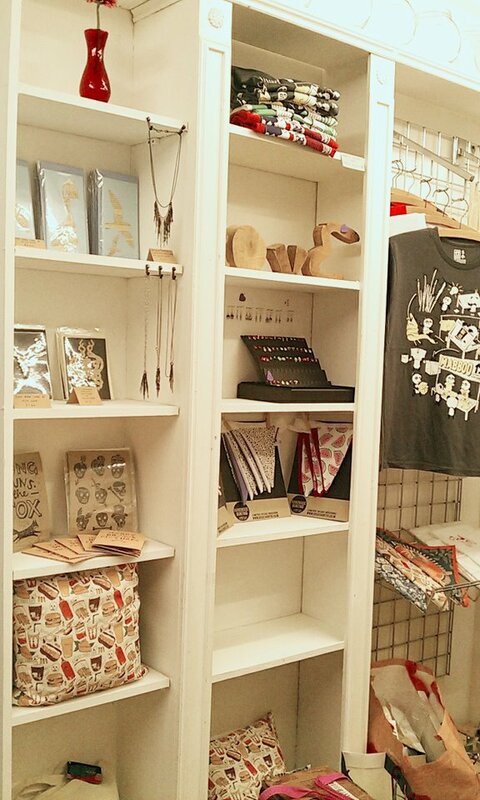 Zeena Shah & Bread Collective will be hosting screen printing and art workshops for children with Autism and Asperger Syndrome on Thursday 23rd August / 11-2pm. 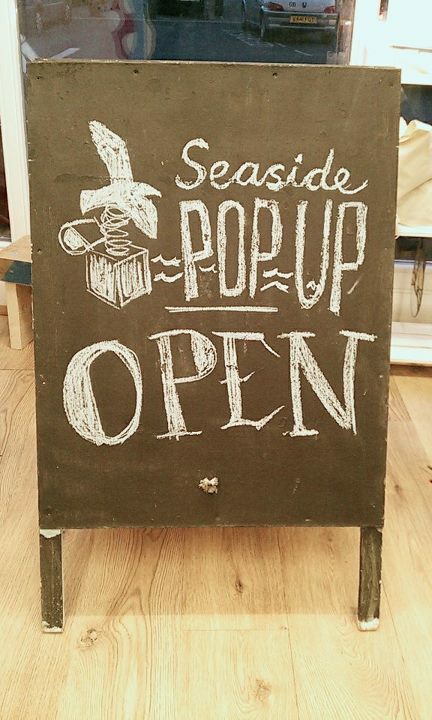 Together with a group of friends and local creatives we have set up a pop up shop in Rottingdean, Brighton. For the next 4 weeks we will be showcasing local artists work including beautiful limited edition prints, handmade jewellery, cards, rustic furniture, bunting and more. 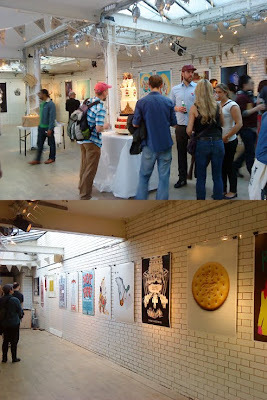 For one night only, XOYO gallery will be holding an illustration exhibition comprising of an eclectic mix of work from 60 illustrators and designers, on Thursday 23rd August 2012 / 6pm 'til late. 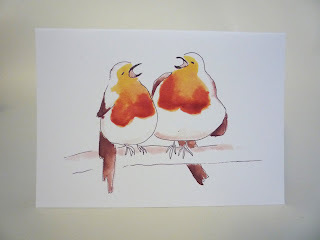 Zeena Shah & Bread Collective will be hosting screen printing and art workshops for children with Autism and Asperger Syndrome on Friday 24th August / 11-2pm. 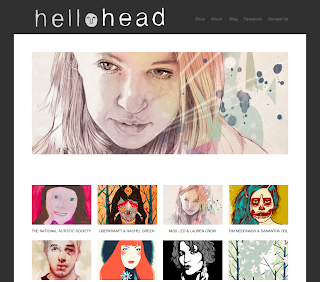 hellohead – Is a portrait-swap project curated by Illustrator Lucy Joy & Rosie Shorter to raise funds for the National Autistic Society. A portrait-swap between 60 illustrators, the results of which will be recorded on the website (www.hellohead.co.uk). 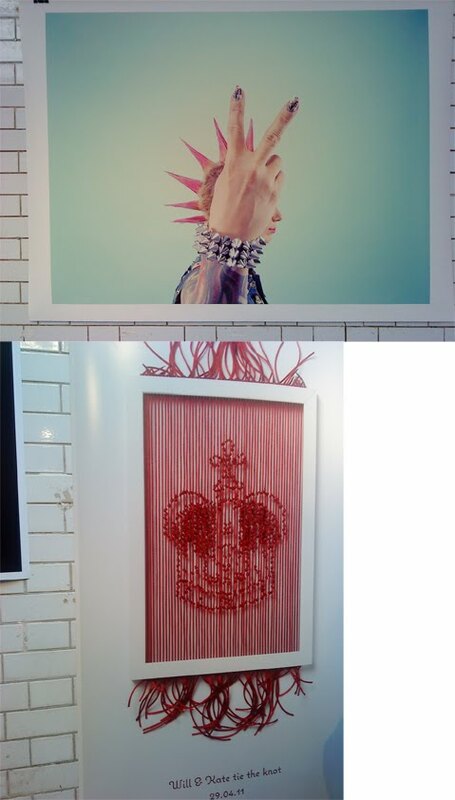 The work will be displayed in central London, location to be confirmed. 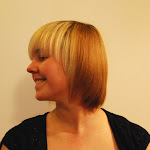 There will be a silent auction to raise money for the National Autistic Society where Lucy is a volunteer. Other activities planned for the private view evening include a peep board with photography, live portrait drawing, and music - all of which we hope will raise money on the night. The NAS will be distributing flyers and promo material through their network once the space has been agreed. 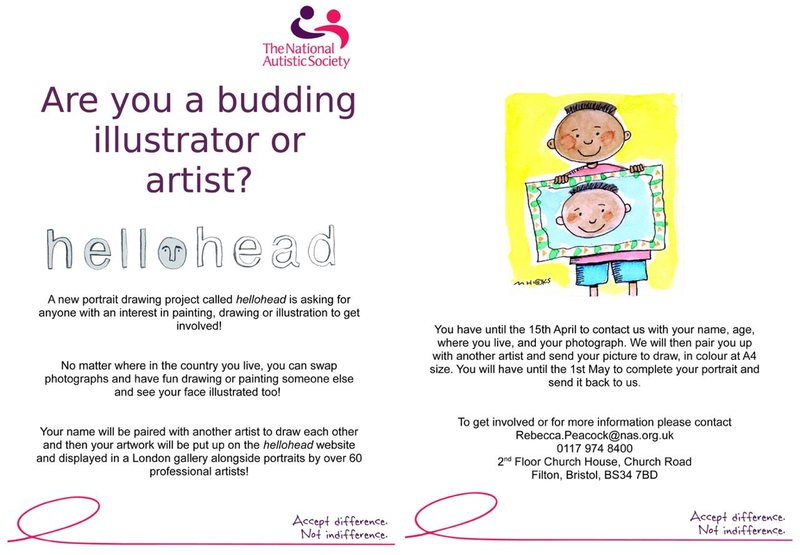 We are also encouraging children that belong to the NAS to be involved with the portrait-swap project, giving them a fantastic opportunity to have their work exhibited in London. 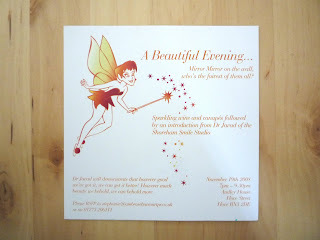 We hope as a result that we will inspire and build connections with other autistic children who are budding artists. 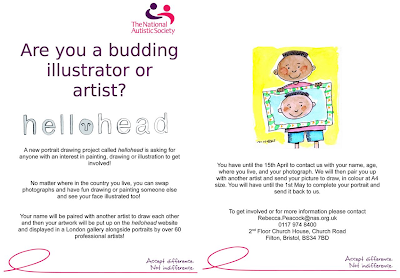 The Illustrators that are involved in the project are all very talented and we have had a fantastic response from them all, we can't wait to see the final portraits. 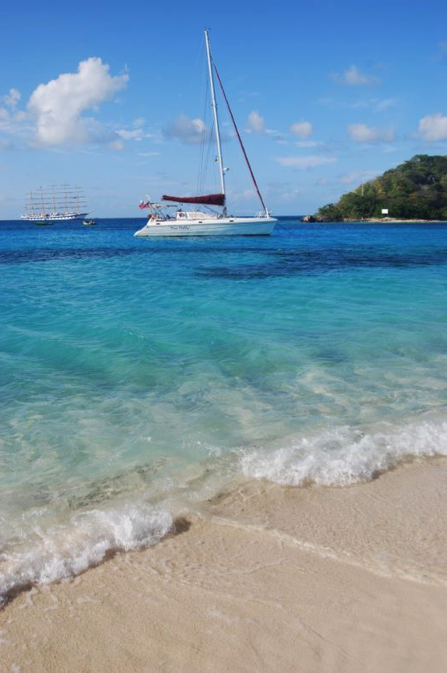 After sailing across the Atlantic (23 Days at sea!) and exploring the Caribbean I am happy to say I am back in business and looking forward to new collaborations, murals and making beautiful things. I was very excited to get involved with Riki Tiks re-launch on Friday 26th August. 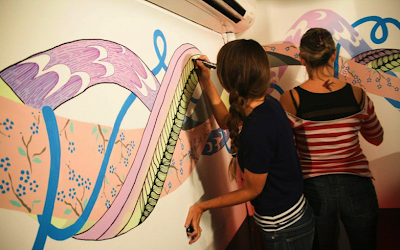 The night was a frenzy of live art, DJ's and Sailor Jerry. Myself & Helen Crawford-White joined forces to create beautiful swirling ribbons full of intricate detail and designs. 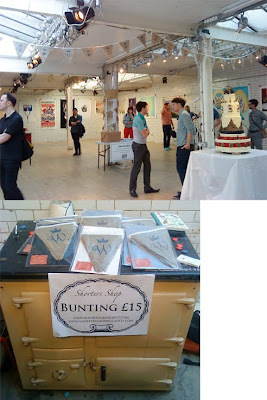 Other artists included Pinky, Megamunden, Will Scobie and There Will Be Unicorns. More pics from the night here! I have just created a bespoke peep board for The Student Room. 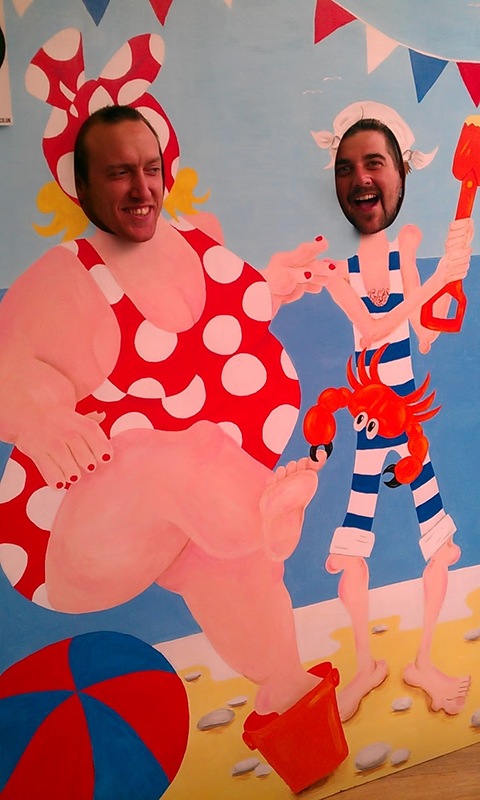 With offices now in London and Brighton a very apt theme of mods & rockers took hold set of course on Brighton beach. This board will travel to events and shows and when not on tour will be in the London office bringing a bit of Brighton seaside to all. There are lots of references to the The Student Room website and the services and help they offer. 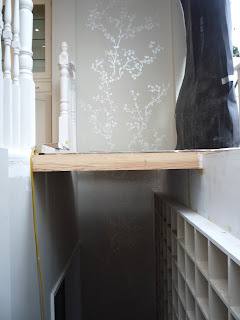 Above are a few shots of the board and how it is supported. To withstand British weather all the wood is treated and the image has several layers of matt varnish over to protect it and there is a narrow capping along the top to stop the worst of the rain. 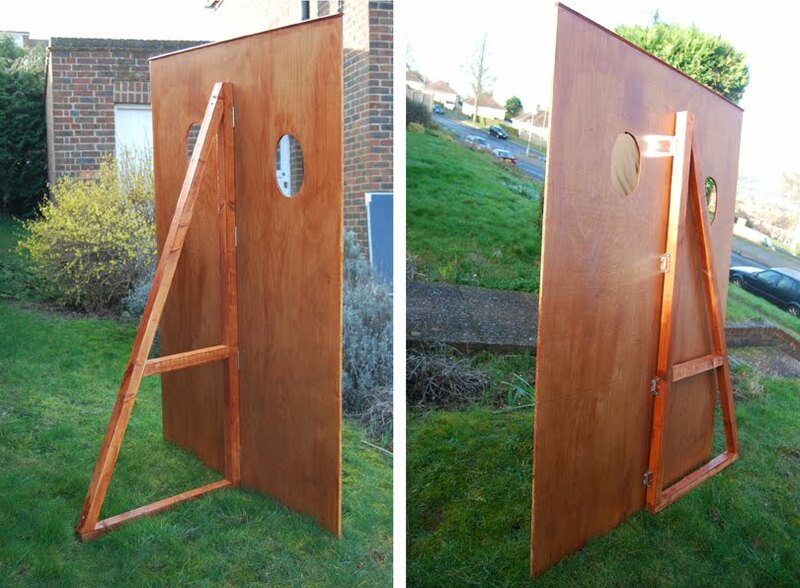 The hinged A frame means the board will stand independently and can be easily packed up for storage. 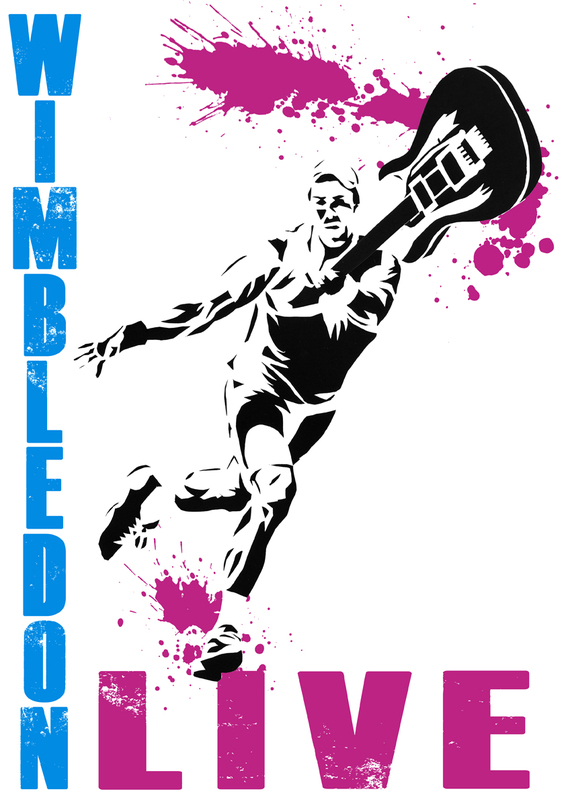 I recently created an illustration for Wimbledon Live, a night of live music and tennis. Very exciting! My magic LED light-up wands are now for sale at Cheeky Monkeys in Rottingdean (Brighton Village)! 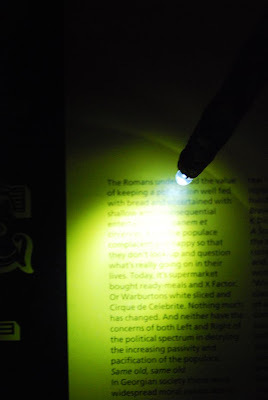 These are handmade and have a bright led light that switches on and off at the push off a button. 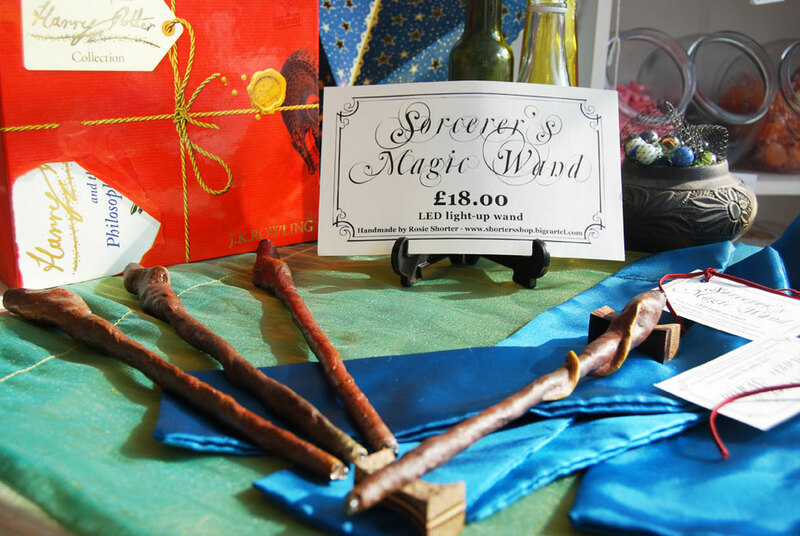 They come in their own blue satin bag and are a great gift for any magic lover or book worm who is after a secret night light! 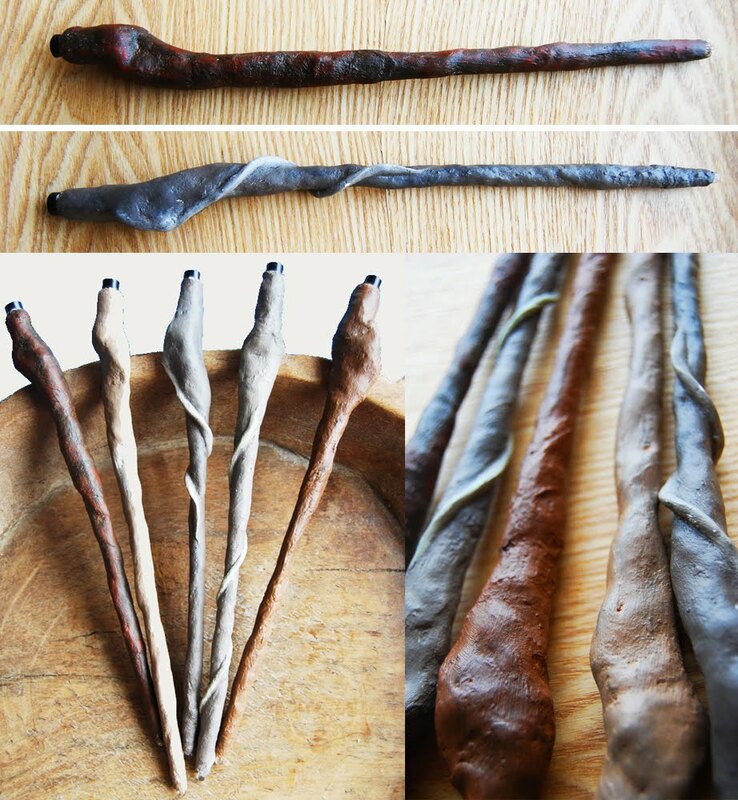 These are not a toy and are not suitable for young children due to small parts. A right royal affair last night saw the unveiling the the 'Alternate Royal Wedding Invite' by 30 top illustrators and designers. 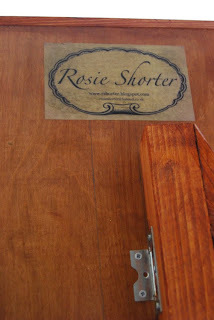 'RSVPHRH' was a huge success and I can't wait to hear more on the silent auction! 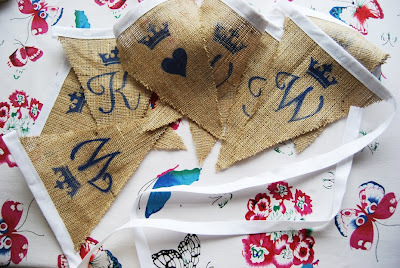 I was there selling my rustic hessian Royal Wedding Bunting which hung from the rafters ... you can't celebrate the royal wedding without bunting! 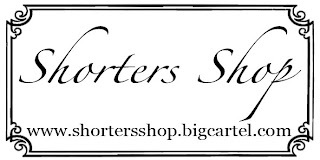 'Shorters Shop' is now open! 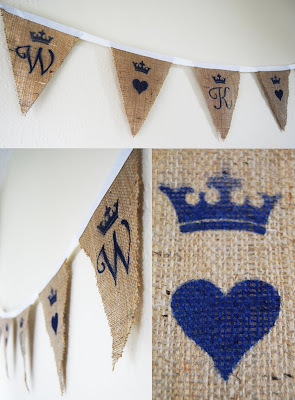 Lots of lovely gifts are on sale from rustic royal wedding bunting to magic light up LED wands and 'stick your head thorough the hole' peep boards! With the big day approaching for Kate and William why not get in the spirit and throw a party ... or even a street party! These single sided hanging flags are made of hessian (burlap) with blue stenciled designs showing the couples initials, heart and crown. 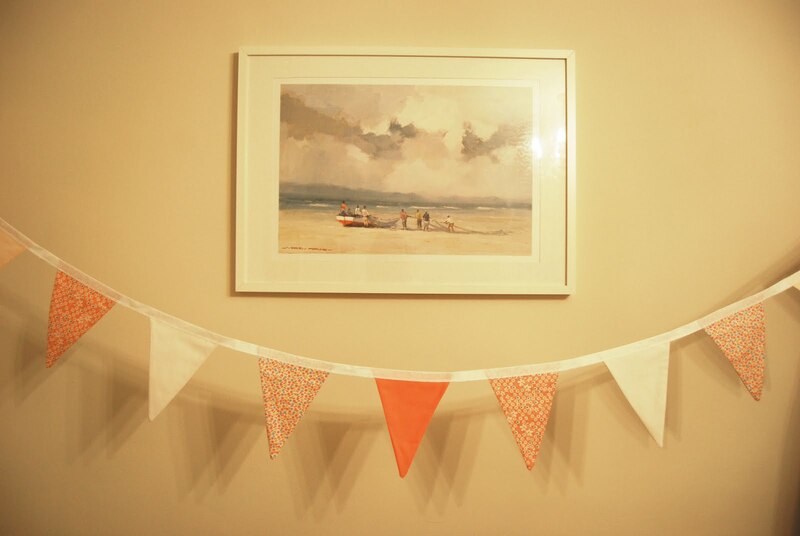 With a rustic countryside charm this bunting looks great strung up indoors or around the garden. 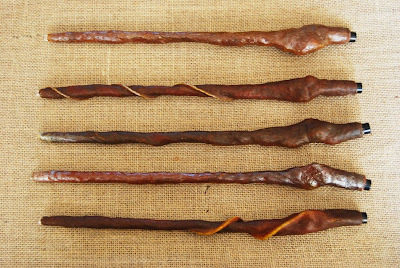 Theses magic light up wands are handmade and can be crafted to your specification, by adding twisting vines or a touch of gold. 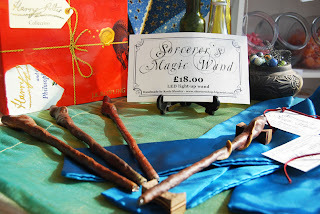 For anyone that loves Harry Potter or fantasy these are a great gift and add a real touch of magic. Approximately 30cm in length these are a great gift or fancy dress prop. All wands are unique and individual and come in all shapes and sizes, colours and detailing. With a click on, click off switch in the base they are easy to operate. This is attached to a cell battery which cannot be changed and this in turn lights a bright white led at the end. Each wand comes in its own string pull bag. My latest commission for Coast magazine has just had it's first outing at Hastings pier to raise money and awareness of the famous pier that is in need of serious repair after the fire. The peep board went down a storm, at 6x4 ft this board is great fun for all ages and brought a bit of the British summertime to all. 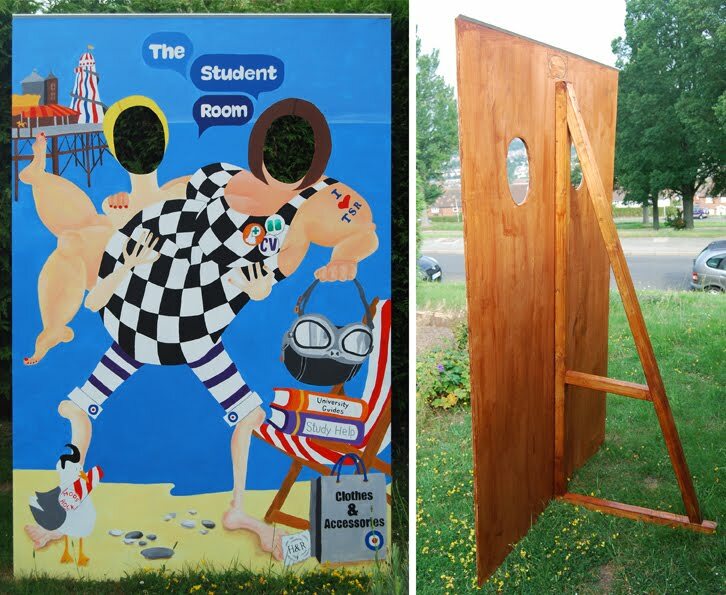 Above are a few shots of the board, how it is supported and the extra blackboard that was part of the commission. This blackboard can be used over and over, advertising whichever event Coast are at. 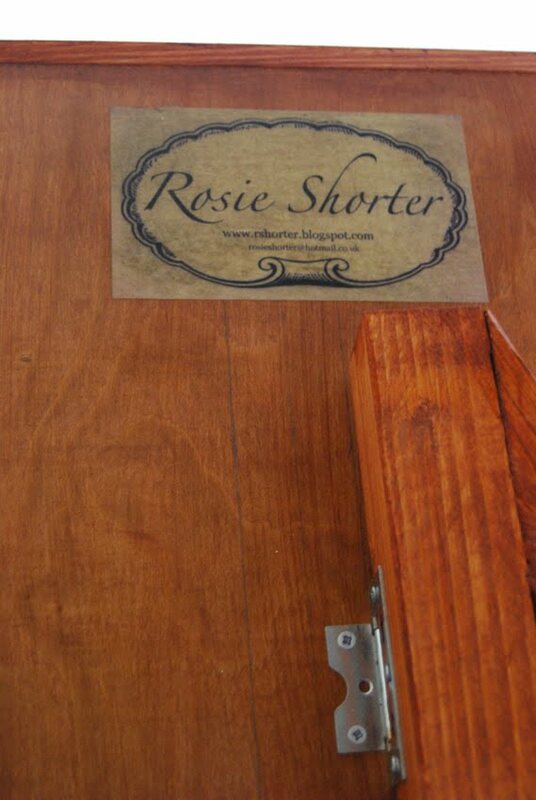 The board has to withstand British weather and so all the wood is treated and the image has several layers of matt varnish over to protect it. There is a narrow capping along the top to stop the worst of the rain and small metal feet to raise it off the ground slightly. The hinged A frame means the board will stand independently and can be easily y packed up for storage. A new found love of bunting has got the sewing machine out and I'm away creating streams of little flags. If you would like to decorate your home or have a special celebration coming up perhaps a birthday or new the arrival of a baby, bunting is a great way to make it an extra special occasion. A magical tree for a magical place! 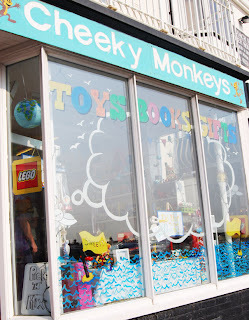 'Cheeky Monkeys' in Rottingdean is the BEST toy and book shop around. To mark the opening and a special visit from Snow White I created a twisting Autumnal tree to arc over the sweet filled counter. Many thanks to Snow White who is busy at Worthing panto for popping by and making some little girls very happy! 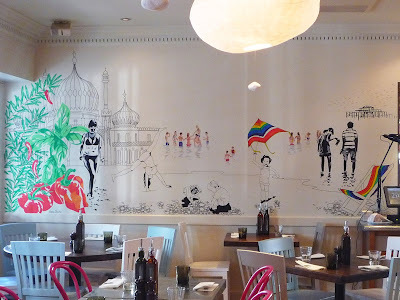 Check out my latest commission for Zizzi's Restaurant in Brighton ... hope you like it! 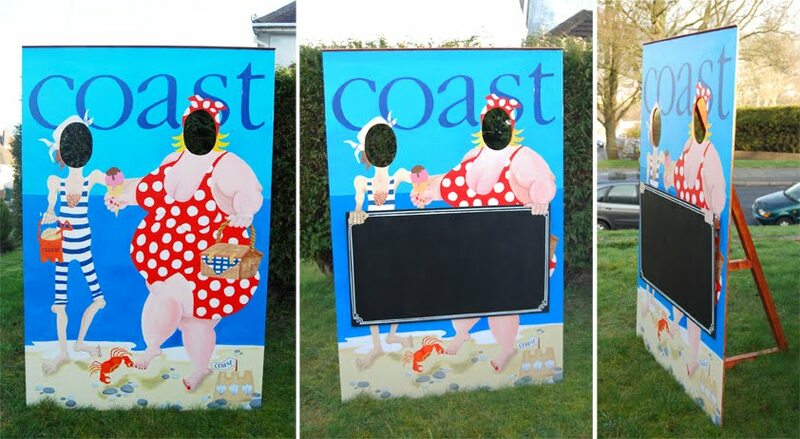 A seaside peep board, 8ft x 6ft, for a local Props company. And check our my latest peep board for 'coast' magazine here. 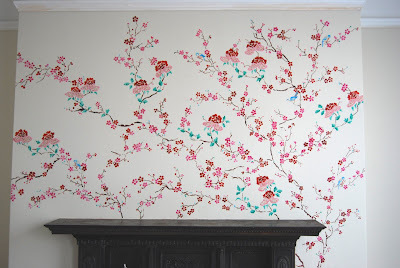 This mural was fantastic to do. 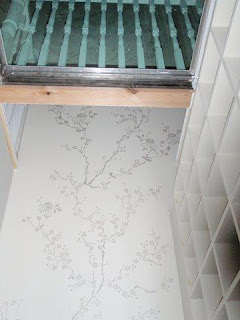 Two walls one 3 meters and the other 6 meters high rise from the basement up to the ground floor this cherry blossom tree was a real challenge. Having a specific brief from the client I experimented with a range of paints and techniques to come up with this shimmering light reflective effect. 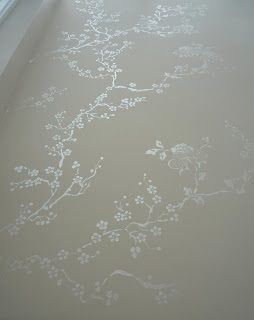 This handmade mix works brilliantly with the light only showing glimpses of this subtle delicate design at any time. 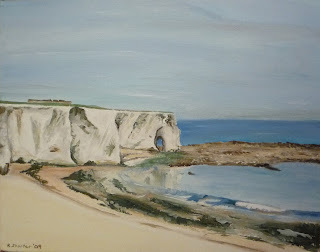 A painting of Kingsgate Bay to be exhibited at the Bayside Brasserie in Broadstairs. 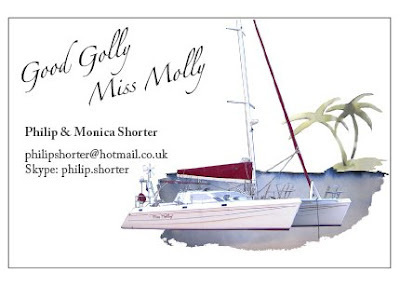 A business card for my parents who are off sailing round the world! 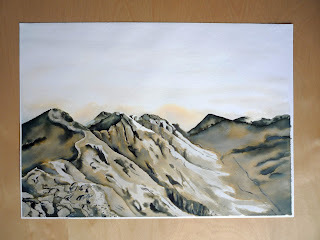 A3 - Brush and Ink, this painting was a special commission of Aonach Eagach, one the many Monroe's in Scotland. 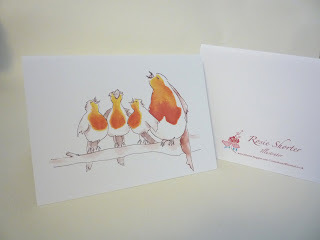 Recently designed Robin Christmas cards. 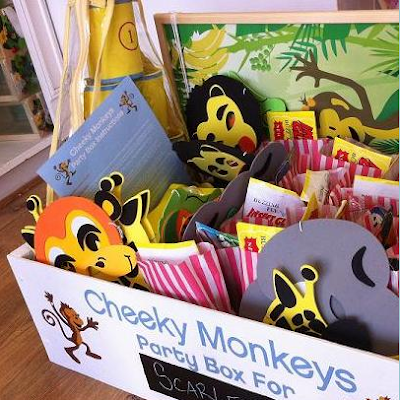 Being sold at Christmas fairs across the country. If you are interested in purchasing some do let me know. 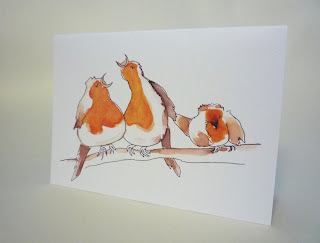 My personal favourite is the 'Squawkers', two howling Robins and one very embarrassed youngster - remind you of anyone! 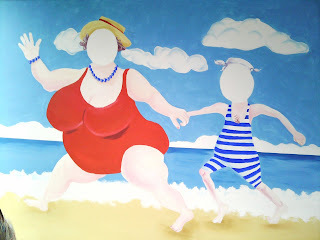 A real pleasure to do, this was a private commission for a bedroom. 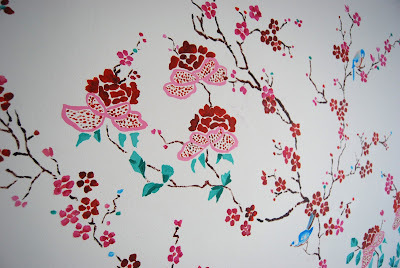 Taking a two days the intricate detail had me seeing flowers and birds for days. 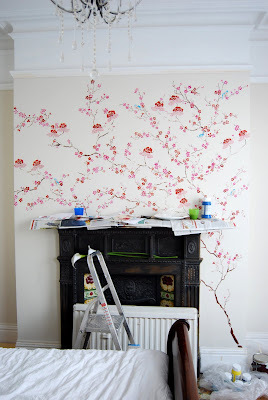 The blossom tree works it way across the chimney breast scattered in small flowers, berries and birds while heavy camellias weigh the upper branches down. 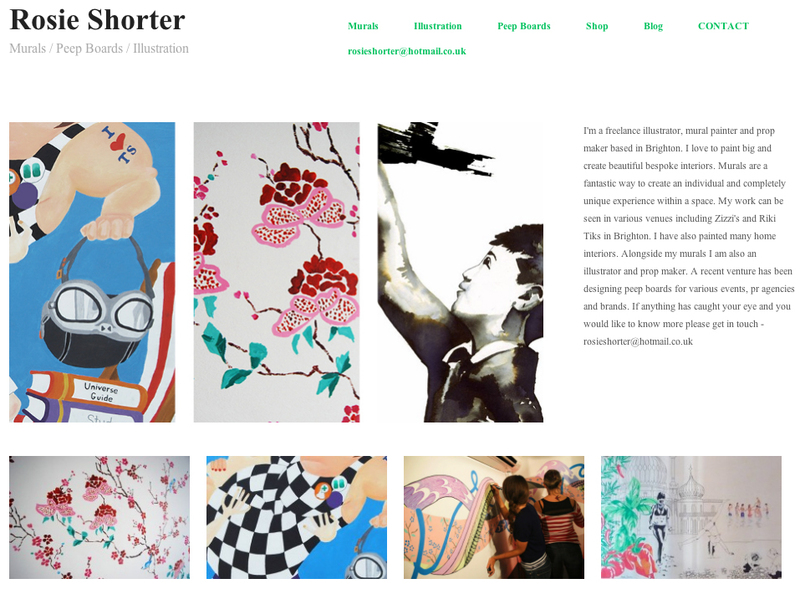 Always happy to do private commissions I would love to hear from anyone that would like a bespoke painting within their home or business.